Mrs. 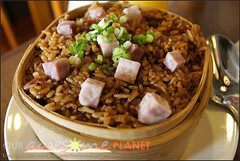 Awesome Planet » Blog Archive » Another Alternative of Lutong Macau ~ Eat Well! « Update on Tours! Come and Join! Another Alternative of Lutong Macau ~ Eat Well! A favorite of AD. No one can have it but him. I got to taste it and it was really good. Fresh and meaty! (I mean shrimpy!) 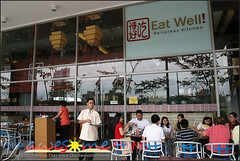 I would love to have an eat-all-you can hakaw! Lovely when I saw the photo on the menu and now, I wondered, why did we get this? Because we love soup! Value for money because there were 3 pcs of dumplings and 3 slices of beef. Garlicky soup that you’d slurp it all the way while it is warm. Ambiance: HK setting as our background. Feeling that we’re in HongKong. I was too hungry! Grrr! Second time around being a hungry mom! 2 kids to feed. 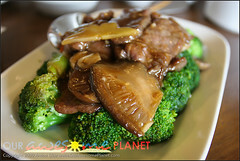 We wanted a vegetable dish as part of our lunch and we decided to have this boring brocolli with sliced beef. I got the shitake mushroom! AD got the small trees! One of his favorite vegetable! This is similar to machang…suddenly, I remembered my grandmother who is so good in cooking Chinese food. Everytime I eat Chinese food, I tend to compare it to her cooking. It was just bad that she is in no condition to cook for us nor share the recipe to her grandchildren. I am ashamed to admit that I took it for granted. 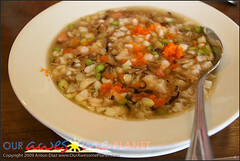 My favorite’s are her machang, lumpia, kalabas and labanos cake, lomi, shark fin’s soup….everything she cooks, I love! She makes tikoy too! Now, I haven’t eaten tikoy for 2-3 yrs now because she doesn’t make any anymore and I don’t dare it other tikoy because I know she makes the best tikoy! Back to this rice….Uhmmm, I didn’t find much braised pork in there. What was obvious were the taro cubes on top and the chopped onion leeks. I didn’t like this one (see? I tend to compare it with my grandma’s machang!) becuase I thought it tasted soy sauced rice and with a hint of the taro leaves since the rice was steamed on top of the taro leaves. I loved this! I felt healthy eating this….Egg whites at the bottom and yummy bits of seafood (fish, shrimp and squid) with mushroom! Yummy! 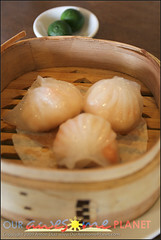 Again, I remembered the Steamed Egg with Mushroom which is a little bit similar to this. Bestseller of the house! At first, I was hesitant to order this because AD has cough and colds but what the heck?! 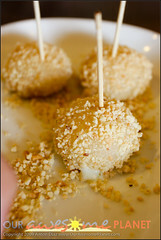 I’m curious why people order this…and this was the reason why….fresh from the steamer….oozing white chocolate…..sticky balls with crushed peanuts to add texture to the masachi balls…One take out please! We enjoyed the cooler masachi at home. It is good that JX is still small that we got at least 2 pcs each. AD got 3! He didn’t let his Poppa get his other share. He loves desserts! 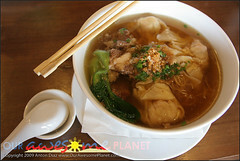 Will surely visit the place soon! My in laws would be home in the next few days and I’m sure they’ll love this….surely an alternative to their favorite Lutong Macau along Jupiter St. This entry was posted on Monday, February 9th, 2009 at 1:48 am	and is filed under Outing, Food Trips. You can follow any responses to this entry through the RSS 2.0 feed. You can leave a response, or trackback from your own site. I was just thinking of your A-ma and her yummy food! But, but, but! Even your mom cooks well and so do you! I was just about to comment that you should cook lomi and the lumpia. I remember you cooked those before in one of our Christmas gatherings when Coko wasn’t feeling well and it was SO delicious! Cook na! Dali!!!! the hakaw looks yummy! I am really a big fan of anything with shrimp the dessert looks good too! yum. Fyi, they are now open even on Saturdays. entirely cost-free mp3 songs downloads and free mp3 music downloads. styles such as mid, wave, and mp3. by respectable music download business. as totally free from all type of viruses as well as malware. No longer do you have to spend a lot of money to be able to listen to your favorite music. papers when in this technological world the whole thing is available on web? A few of my blog visitors have complained about my blog not working correctly in Explorer but looks great in Firefox. Anyway I will be subscribing on your augment or even I success you get right of entry to constantly rapidly. I to find it very bothersome to inform the reality nevertheless I’ll certainly come back again. Daу with heelp from the flower specialists. out from Humble Texas! Just wanted to tell you keep up the good work! really excellent stuff for visitors. if you don’t mind. I was interested to find out how you center yourself and clear your thoughts prior to writing. I have you bookmarked to look at new things in your website. I visited many blogs but the audio quality for audio songs current at this web page is really excellent. What’s up to every body, it’s my first go to see of this website; this website consists of awesome and in fact fine data in favor of readers. net. I’m going to highly recommend this blog! Thank you for every other informative web site. Where else may I get that kind of info written in such an ideal way? I’ve a undertaking that I’m simply now working on, and I’ve been at the glance out for such info. I am reading this wonderful article to increase my knowledge Mrs.
Lutong Macau ~ Eat Well! . you made running a blog look easy. The full look of your site is excellent, as smartly as the content! Spam protection: What is the sum of 10 + 7 ?